Located at 2013 West Division in Wicker Park, Takito Kitchen is now open. Takito offers Mexican-inspired cuisine created by Executive Chef/Partner David Dworshak (Carnivale, Spring) and a complementary beverage program led by Beverage Manager/Partner Adam Weber (Trencherman, Mercadito, Roka Akor). The menu features seasonal shared plates, ceviche, tacos, soups and more with a focus on fresh ingredients and complex flavors, all tucked inside a homemade tortilla. The modern day taqueria will open at 5 p.m. Tuesday through Sunday and will be closed on Mondays. The restaurant will not accept reservations, though they will offer a No-Wait texting option. The space is industrial and modern featuring an open bar and kitchen and will offer seating for approximately 80 people. 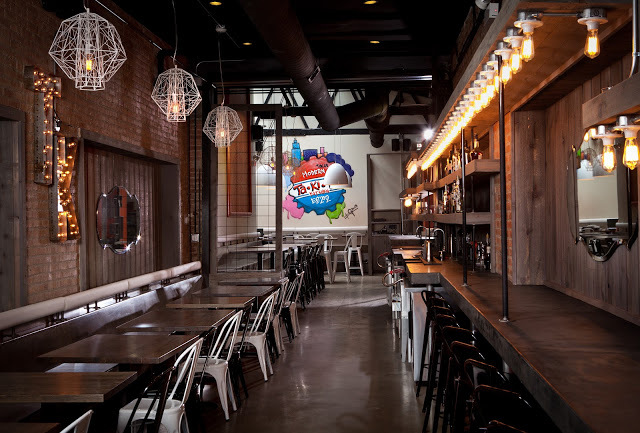 Designed by D+K Architects and Interiors, the room includes an old skylight, long-cement bar, handcrafted maple benches, distressed cedar wood tattered with ebony stains, street art by local Chicago graffiti artists, and custom antique-style lighting. “The open bar and kitchen design will allow Adam Weber and I to closely interact with our guests providing them with a heightened dining experience.” says Chef Dworshak. Menu highlights include: Avocado Pine Nut Puree with pickled garlic, chile piquin, piloncillo, and cilantro, Yucatecan Style Chicken Soup with green plantains, recado verde, avocado, and lime, and a Lamb Chorizo Taco with Brunkow cheese, tomatillo pistachio salsa, jicama escabeche in a fresh tortilla made from locally sourced corn. The complete dinner menu is available here. Focusing on craft cocktails, the Takito drink program, designed by Beverage Manager/Partner Adam Weber, features cocktails centered around various high-end tequilas and rum in addition to Latin beers, wines and sangria. Highlights include various margaritas such as the Cucumber Margarita, the La Paloma made with lime, grapefruit, and tequila served in a small clay jar, and the ¿Por qué No? with lemon, blueberry, peach, and mezcal, and agua frescas. The complete beverage menu is available here.